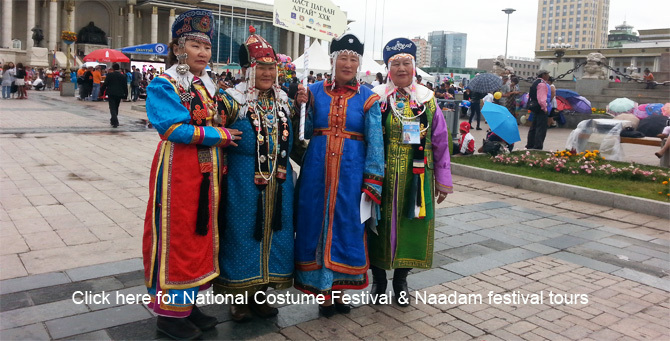 The Mongolian national costume is a deel, which is made from silk, textiles and sheep skins. The deel is Mongols' traditional garment worn on both workdays and red letter days. It is a long, loose gown cut in one piece with the sleeves; it has a high collar and widely overlaps at the front. The deel is girdled with a thin silk sash several yards long wound tightly around the waist. Each ethnic group living in Mongolia has its own del distinguished by its cut, color and trimming. 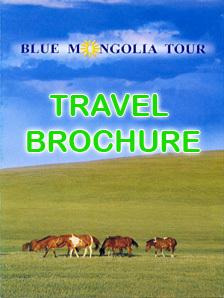 The distinctions go unnoticed by foreigners, yet the Mongols they are obvious. Before 1900-s all social strata in Mongolia had their own manner of dressing. Livestock breeders wore plain wide deels which served them more comfortable for doing house holding and cattle caring works. The priests wore yellow colored deels with a cape thrown over it. Secular feudal lords put on smart hats and silk waistcoats. But soldiers wore plain deels with special metal decoration on the chest, which's purpose is protection from shooting. The kings and queens, their relatoes wore the impressive decorated deels with precious stones and gold and silver. Commonly there are three varieties of deel each for a particular season. The first, so called Dan deel, is very much like a dress, a frock cut in one piece from plain cloth without padding. Rural women wear dan deels all year around. In cold weather they put on warm clothes over it. Terleg deel is slightly padded deel, and usually worn in early morning cool or late evening. Another one is winter deel, which is padded with sheepskins or cotton wool. Deels for men and women are of the same cut. The difference is that male deels size and its decoration are wider and more demure colors. The difference is that male deels size and its decoration are wider and more demure colors. The pattern is simple enough. The sleeves are cut together with the gown and there are only minor details. The deel for everyday wear is grey, brown or some other dark color, while the holiday costumes is a bright blue, green or claret silk with silk sash of a contrasting color and several meters long. The sash is not simply an adornment. It also serves as a soft corset facilitating long hours of riding on horseback. In olden days men attached some essential objects such as a sheathed knife, the eating set, tinder pouch, snuff bottle, and tobacco and pipe pouches. The deel collar, breasts and sleeves are trimmed with colored brocade tape which can be wide or narrow depending on wearer's taste. The deel buttons, if they are not commercially produced from decorative stones or silver, are narrow strips of cloth tied into intricate knots. In olden days married women wore intricately cut deels, which had stitched in sleeves with camel wool padding on the shoulders and wide horseshoe shaped cuffs. Women of high birth preferred deels of silver woven brocade with a rich trimming of colored silk. This kind of deel requires a special style hap trimmed with sable fur, and intricate hairdo and silver ornaments. Men have always been content with more modest costumes. After all, the ordinary people's clothes are supposed to serve purely utilitarian purposes. They should keep them warm, allow unhampered movements, when working or riding on horseback and at times serve as a blanket at night. In the past Mongols also wore a waistcoat, jacket without sleeves, on festive occasions or winter severe weather they wore wonderfully decorated jackets or well padded warm jackets. The jacket was made from broadcloth and trimmed with a wide patterned tape contrasting the color of the waistcoats. The ornaments and volutes with symbolic designs are run along the edge of jacket. Regarding the boots, all people wear the same styled and shaped high boots. 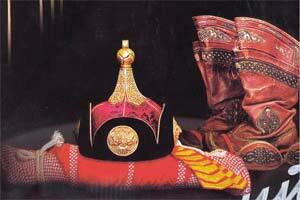 The Mongolian boots wore by ordinary people and lords are distinguished from their decorations. Mongolian high boots were made from thick unbending leather, a bit processed skins, and the top of it is decorated with leather appliques. The right and left boots have the same shape. The boots were worn with thick socks made from quilted cloth. High boots had no heels while their pointed tips were upturned. There are several explanations for this. 1. For working in the pasture and living as nomads, the boots with high heel is not adequate wearing. 2. The wide boots without a heel makes a light pressure on the earth and it prevents inadvertently the pasture to be kicked and damaged. 3. While wearing Mongolian boots, the thick socks fill the most of space in boots and little space is left as vacuuming in the part of upturned tip. So the vacuuming warm air protects toes to be cold and to be frozen. 4. The upturned tip prevents the stirrup slipping off the foot. Hats and headgears. Before 1900-s the men wear headgear to show their social status. Soldiers had sharp pointed rigid hats with for turned up brims and a knot on top. Today this styled hat is indispensable attribute of the wrestlers outfit. Clerks and lords wore Manchurian styled hats with a peacock feather and colored stone on the top of hat, which's size and value, indicate the official's rank. For ordinary people, who were cattle breeders or poor people, loovuuz is a hat for winter seasons and is was made from sheep fur or fox fur. The loovuuz strings are tied under the chin, only our face remains exposed. In warm weather the strings are tied on the back of head, so the hat only covers back of the head. In summer time, all cattle breeders: both of men and women tied their heads with white kerchiefs. Girls wore a toortsog, a silk covered round hat with six gussets and a ball like knot on the top, from which long nice tapes hung down. Rich young women attached pearl strings to their hat. Married women wore high crowned black velvet hats with silver decorations. Such headgear demanded special hairdo, with the hair arranged in the form of wings. There is belief that this type of hairdo symbolizes the eagle protector of the family hearth. Both the men and women wore special hat for festive occasions. The festival headgear and hats are decorated with semi precious stones and silver decorations and it is recorded that the heaviest headgear was 10-12 kg. The hat fashions did not identify the utilization purposes but also expressed the Mongols aesthetic tastes. Moreover, each type of headgear for women and men had symbolic purpose. For example: the common hat is Janjin hat. The hat's top symbolizes the mountain- the legendary land of the Mongols' forefathers, the knot on the top of the hat shown the unity of the nations, the two red ribbons are the suns rays and broad brim symbolizes the country's inaccessibility. Nowadays modern town people prefer certainly to accept the European fashion. 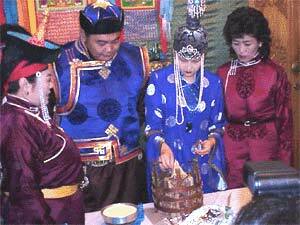 But in some national holidays, Wedding ceremonies or other festival days Mongols wear national costimes-deels. In the cities people as they grow older, especially, women appreciate the advantages of wearing deels, trying to excel each other in the choice of fabric, as well as in the elegance of the cut and originality of the trimming. The revived interest in national traditions snow prompts even younger people to wear deels.